Welcome to the Society's Web Site dedicated to the Weimaraner. NEWS Open Show on 28th July 2019 at Leeds Ch Show. Further details on the Events page. 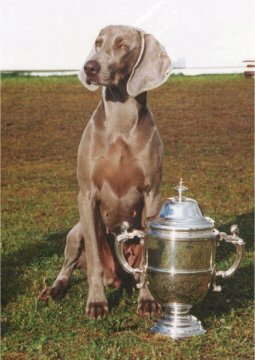 The North of England Weimaraner Society was founded in 1992. The Society is dedicated to the Weimaraner as a pet, show dog or working dog. Although our title includes the "North of England" we invite member applications from anywhere in the U.K and likewise overseas. A medium size , grey short-coated dog (unless of course the Long-haired variety) with light coloured eyes. The dog presents a picture of power, stamina and balance. The hunting ability of the breed is of paramount concern. The breed is fearless yet friendly, protective, obedient and very alert and needs plenty of stimulation and has a brain that needs to be occupied. The Weimaraner is a multi-purpose Hunt, Point and Retrieve gundog. This breed requires consistent treatment from sensible owners. A lively, cheerful, affectionate animal that can be stubborn. A very hardy breed with a good sense of smell and a passionate worker. Also trained easily for the show ring where he makes a handsome presence. The correct colour of a Weimaraner is grey or shades of. It is not blue. To read more about the colour, please read the information on the Colour page. Throughout the year the Society holds a number of events across the North of England. 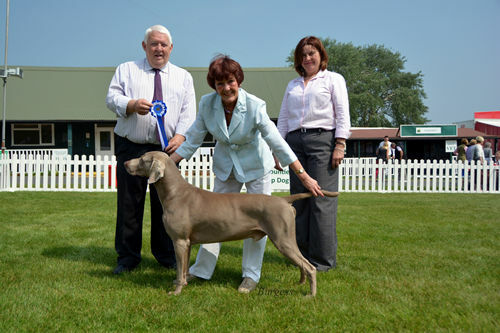 There are two breed shows a year, consisting of a Championship show in April and an Open show in July, currently held in conjunction with Leeds Canine Association. The Society also organises training days for those interested in working their dogs and also educational events in the format of one day seminars. Please visit our Events Diary Page for further details. The Society provides a NEWSletter for members once a year, which will be sent to members at the end of each year. The Editor, Patsy Hollings is always pleased to receive contributions . Please email Patsy with your articles. ANGEL is a Champion German Shorthaired Pointer, owned by Dawn Elrington, a member of the North of England Weimaraner Society.